This journal entry outlines how the user manual is being created. Ever saw a manual you thought was weak or lame? Now is your chance to provide your own feedback on a manual before it goes out to the printer. You have been chosen to compete in the Arenas of Rokkur in a contest against your rivals to ascend from the mortal places into the Pantheon of the Gods. You shall battle alone as well as be on teams of convenience with and against your fellow Demigods. These Demigods have come from different realms, different worlds and different planes of existence to win the favor of the Gods and ascend to Godhood. Each victory in an arena provides you with favor points that you can use to move closer to ascension, drive an opponent further from ascension, or acquire special items to aid you in future battles. Installation requires approximately 3 gigabytes of disk space on your hard disk drive. After running the game for the first time, press the “Update” button from the main menu to make sure you have the latest version of the game. The update button will open Impulse which will require you to create an Impulse account if you don’t already have one. This account will be used if you play the game on-line. Impulse will allow you to update to the latest version as well as re-download the entire game should you lose the DVD in the future. You will need your game’s DVD key to register the game to your Impulse account. The Arenas of Rokkur do not exist in the mortal realm. They are a manifestation of the ancients with the sole purpose of helping prove which Demigod is the worthy to ascend. This means that while Demigods can die in Rokkur, it is not permanent so long as they die in the arena. Similarly, the items, weapons, armor and other tangible constructs only exist within the Arena in spiritual form. Thus, Demigods who recognize this can stack different types of items together that could not be in the mortal world (the only hint the Gods provide is that the items, when equipped, cannot be visually seen by observers or other Demigods). 1. The Great Citadel. This is the base of your side’s power. If it is destroyed, your side loses. You can use money to upgrade the Citadel. 2. The Item Shop. Weapons, armor, potions and other items are purchased at the item shop. a. Flag of Experience. Controlling this flag will result in your team gaining experience at a substantially greater rate. b. Flag of Celerity. Controlling this flag will result in spells having much shorter cool-down times for your team. c. Flag of Brilliance. Controlling this flag greatly increases the mana pool for everyone on your team. d. Flag of Fortitude. Controlling this flag greatly increases the hit points for all Demigods on your team. e. Flag of Valor. Controlling this flag greatly increases the strength of your reinforcements (hit points, attack, defense, etc.). 4. Special Structures. There are several special structures available in the arenas. When captured, they can provide more reinforcements, more gold, access to artifacts and more. · Conquest. Destroy the enemy’s Citadel to win. · Dominate. Control the flags for a certain amount of time for victory. · Slaughter. Attain victory by killing a set number of enemy Demigods. · Fortress. Destroy your opponent’s fortresses to attain victory. · Protect. Keep your opponents from taking and escaping with your War Idol back to their Citadel. 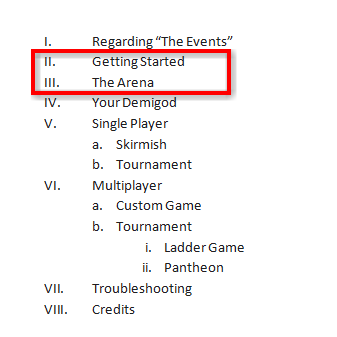 What other elements of the arena would you like to see discussed? What questions would you like to see answered still? Looks good, what about mentioning that an Impulse Account requires an e-mail address for people new to Impulse? Such as : "An Impulse account requires a valid e-mail address." I would also add a mention about how a customer can retrieve keys from Impulse, such as "Once registered, the DVD key can be sent to the e-mail address associated with your Impulse account at any time." (the only hint the Gods provide is that the items, when equipped, cannot be visually seen by observers or other Demigods). I would reword this to something along the lines of " The sole hint given by the Gods is that the items' nature prevent them from being seen by both observers and other Demigods when equipped." A section on portal creeps would be nice. A short explination for each one as well as the fact that the player has no control over them and they follow preset paths. Text wise, everything else looks good. In the final manual, I would asume an image for each topic to let the player know what things look like. Prehaps a map of a sample arena with everything labeled at the end of the arena section. I think "as well as in teams" would be a little better, but that could just be personal preference. The Arenas of Rokkur do not exist in the mortal realm. They are a manifestation of the ancients with the sole purpose of helping prove which Demigod is worthy of ascension. This means that while Demigods can die in Rokkur, it is not permanent so long as this occurs in the arena. Similarly, the items, armor, and other tangible constructs only exist within the Arena in spiritual form. Thus, Demigods who recognize this can stack different types of items together that could not be in the mortal world (the only hint the Gods provide is that the items, when equipped, cannot be visually seen by observers or other Demigods). The section about the Citadel should mention briefly what the upgrades are for, like "You can use gold to upgrade at the Citadel. These upgrades can increase the strength of your grunts, increase your gold income, decrease the re-spawn time after death, and more". Also be sure that you are consistent with whether it is called gold or money. The only "weapons" in the shop that I can think of are a few items like the Universal Gadget that damage units, but aren't really the weapons that a new player would expect based on your description. There are types of armor, like plates and helmets, but there are no types of weapons, like swords or maces; if I was new and read your sentence, I might wonder how to switch the shop to show weapons, or wonder if there was a separate weapon shop. It might be better to just say "Armor, potions, and other items are purchased here." The flags section should briefly mention how to capture flags. "Flags can be captured by any Demigod that stands near them for a certain amount of time. However, there are some items that can be used to lock flags so that the owner maintains control." or something would be plenty. There should be a section about portals. "Portals are situated near the Citadel for each team and regularly provide units to assist the Demigods. These units, called grunts, are uncontrollable and follow a set path down the arena. They can be upgraded at the Citadel. Capturable Portals can be found in the middle of some arenas." I would add the word "also" to the Types of Contests" section: "In all cases, destroying the opponent’s Citadel will also win the game." Also, include that once registered, the DVD is no longer required to play the game. For me this seems to be a huge feature that people will like. So far the way things are put the demigods are fighting each other to become the ONE dominent god, or at least to ascend to "The pantheon of gods." Maybe it's because I only play team matches, but this game feals like a team game, not a one on one kind of game. The story just doesnt really fit how everything works in my opinion. I would prefer to see some sort of team thing or even a simple good vs. evil, or something like that, this one on one feeling is just not right. I'm having a little trouble with the story right now, and that is really my only problem, except I would like to see a a little more about those achievment points (the one used to buy special items ). I see your point, but I think since there's going to be strong single player (well, that's the plan), I think that's where the story bits apply. Or, you could think of it like Highlander - There Can Be Only One .... but why not work together to get rid of the other guys first? I have one complaint, all the demigods are supposed to be the children of the god that got kicked out yet nowere in their backstory do they mention the god. I bolded the parts where I adjusted stuff to make it sound slightly better in my opinion. I don't think there are any weapons, are there? Also, this is pretty clearly a way to explain the fact that you can't actually see the stuff that you buy and can have 5 pairs of boots on at once. It might sound better if you said that they were magical artifacts that granted their benefits merely by being owned by the Demigod or something along those lines, rather than "and by the way, they are invisible and don't exist in the physical world". I strongly agree with Gnats3 here: the phrasing in the "proto-manual" sounds like a cop-out on not having representations of the items on the Demigods (absurd amount of work for something that doesn't enhance the demigod's style, so I can see why) and not having "logic" checks on what Items you use together. I'll just copy and paste, then change things around to see what happens. Editorial interjections will be in [brackets]. You have been chosen to compete in the Arenas of Rokkur in a contest against your rivals to ascend from the mortal places into the Pantheon of the Gods. You shall battle both alone and on teams of convenience with and against your fellow Demigods. These Demigods have come from different realms, different worlds, and different planes of existence to win the favor of the Ancients [when the gods are mentioned directly I prefer to be consistent and use Ancients] and ascend to Godhood. The update button will open Impulse, which will require you to create an Impulse account if you don’t already have one. A valid email is required to make an account. This account will be used if you play the game on-line. Impulse will allow you to update to the latest version as well as to re-download the entire game should you lose the DVD in the future. It will also allow you to play the game without the DVD. You will need your game’s DVD key to register the game to your Impulse account. The Arenas of Rokkur do not exist in the mortal realm. They are a manifestation of the will of the Ancients with the sole purpose of helping to prove which Demigod is the most worthy to ascend. This means that while Demigods can die in Rokkur, it is not a permanent death so long as it occurs within the arena. Similarly, the arms [this refers both to armor and weapons, so I think it works better than either one, especially if no actual weapons are included at release but some are added later, or something similar happens], items, and other tangible constructs only exist within the Arena in spiritual form. Thus, Demigods [the part about those who recognize that fact seems unnecessary, especially since the manual comes right out and explains everything] can stack different types of items together in ways that could not be in the mortal world (it also means that these items, when equipped, cannot be seen [visually seen is redundant] by observers or other Demigods). 1. The Great Citadel. This is the base of your side’s power. If it is destroyed, your side loses. You can use gold [perhaps make a quick mention of ways to earn gold, though it might be best left for later in the manual] to upgrade the Citadel. Citadel upgrades can increase the frequency of reinforcement waves, the power of those reinforcements, the strength of your team's fortifications, and other such things [it seems like it might be good to explain why upgrading is worth bothering with]. 2. The Item Shop. Arms, potions, and other items are purchased at the Item Shop [consistent capitalization of terms]. c. Flag of Brilliance. Controlling this flag greatly increases the mana pool for all Demidgods on your team. 4. Special Structures. There are several special structures available in the arenas. When captured, they can provide more reinforcements, more gold, access to artifacts, and more. *a note about lists: when making a list I find it works best to include commas for all parts, entries, items, etc. This eliminates confusion in certain circumstances. For instance, a list of words and phrases describing extra things you can get might include bling, flash, and bells and whistles. Without the last comma, it'd look like bling, flash and bells and whistles, which is confusing. I suspect a lot of English Major types were taught to make lists without the comma though, so it's really up to you guys which way you want to go. Porphyrogenitus first I think your being alittle harsh with the comma thing. Also gpg wanted to make flags more powerful for the future and this manual is for the final product. Also, you forgot the flags of Rejuvenation and Regeneration, I think. Very nice. Will be very useful when I'm showing other people the game. The comma thing is a personal preference issue, with mine being to include the comma. I did check back on the first entry (the intro) and it looks like they're doing Gods instead of Ancients, so that part of my revision seems pretty much out. All the info about the arenas fits much better if you consider that the intro has all the info about the demigods themselves as far as how they fit into the universe. However, I think that an entry about gold (how you get it, both story- and gameplay-wise) might be good. Perhaps as part of the flavor text regarding the arena. the problem is as I said earlier in all the back storys to all the demigods they have never mentioned, not even once the all-father or what ever their calling him. I hope they somehow put him in them some how. What does the debilitating flag do? Does capturing your opponent's (default capped) Valor Flag buff you or just debuff your opponents? Do flags stack? The Debilitating flag makes enemy units take 10% more damage. But yeah, the Debilitating, Regeneration, and Rejuvenation flags all need to be added. Why would they need to? It's not like every story has to begin at birth. Besides, it should be obvious by the fact that they're even in the game that their father was the all-father. my feedback is just make it look pretty. It doesn't really need fancy pictures per sey. But just maybe a good boarder and a easy gradient on the edges or something that is easy to still read the text over. Whenever I get a manual that seems nice but is all black and while, I feel cheated. Like, out of everything involved in making a game why skip out on presentation by making it have a lame manual right? Ink shouldn't cost that much right? Well in the backstories the demigods didnt come to be by the all-father( it doesnt say and for unclean beast it says book made him). Also rook was made not given birth too, so i think I have a point.